This is the Fresh Crop Balanced Blend brought to you by Kuma Coffee. Fresh Crop Balanced will always be a blend consisting of their newest Central American and South American coffees. 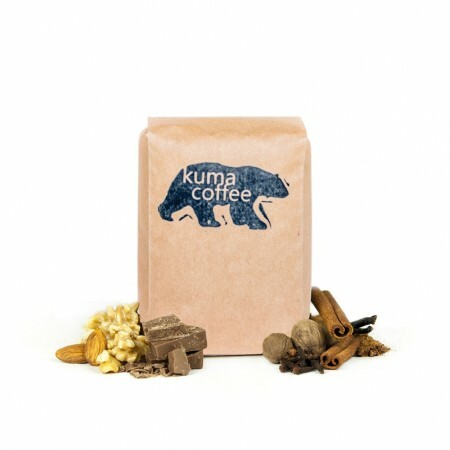 The components will change with the seasons, but the flavor profile of caramel, chocolate and stone fruit will never waver, and we think this coffee tastes great brewed every way. lightly roasted with forgettable taste. This really was a nice cup of coffee. The brew was nice at any time I made it. Usually my mood varies, but the flavor profile here was balanced enough to fit whatever mood I was in; not too much of any one note. Glad I tried this one! A couple other reviews really summed up my feelings on this coffee already. I agree that this coffee is "too balanced" or "too safe". I was curious about this coffee from those reviews as I often like lighter, more subtle roasts. This specific blend was even too boring and subdue for me. Very good to be sure, but there are other beans I prefer. I liked this one. Very good. This coffee was by no means a bad coffee. I enjoyed the coffee. The reason I gave it a three is because it was very neutral/safe - and I prefer coffee that is a little more "wild" or "risky", I think the intent of the blend was to make a coffee that is safe and has broad appeal - the roasted definitely deserve five stars for selecting a blend that nails the intent of the coffee. Really nice cup, well balanced and with decent body. sorry. could not make it work for us. Interesting flavor, reminded me of chocolate-covered raisins. Definitely tastes best with the roaster's recommended ratio of 18g in, 42g out. Loved it...great flavor, excellent roast. So frequency is on point. So I tried this Kuna and to be honest not a fan. Kind of bitter and lacking in punch of flavor. I have it so I'll drink it but I wouldn't buy this coffee again. Was this coffee bean from the exclusive(highest level) light roast selection? I changed from deluxe medium roast after I got my first shipment. The color of these beans and coffee didn't look as light as I thought, that's why I ask. Not my favorite. Not a very appealing aroma and the espresso is very bland in taste. It is hard to give these reviews because the coffee is so good. We are parsing the top 1% of coffee here. That said, is it possible for something to be "too balanced?" If that is possible, then my critique here is that the coffee is so balanced it has lost any particular personality. It becomes "forgettable amazing coffee." In other words, I remember every cup of The Boss Espresso by Barefoot. I don't "remember" any shots of this coffee. I know I drank it, I loved it, but it didn't sing to me.